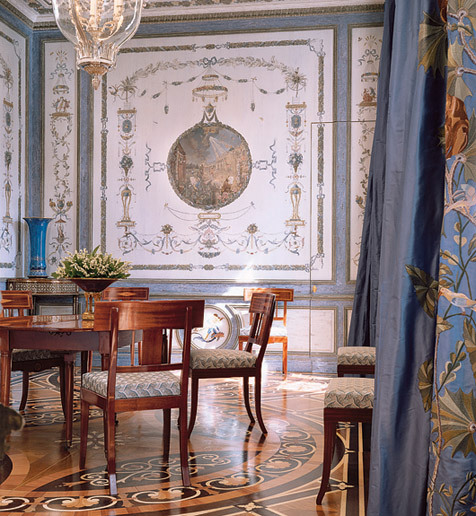 A classical 18th century mix of pure Art Deco, Contemporary, and 18th century design. The home of Jacques Grange. 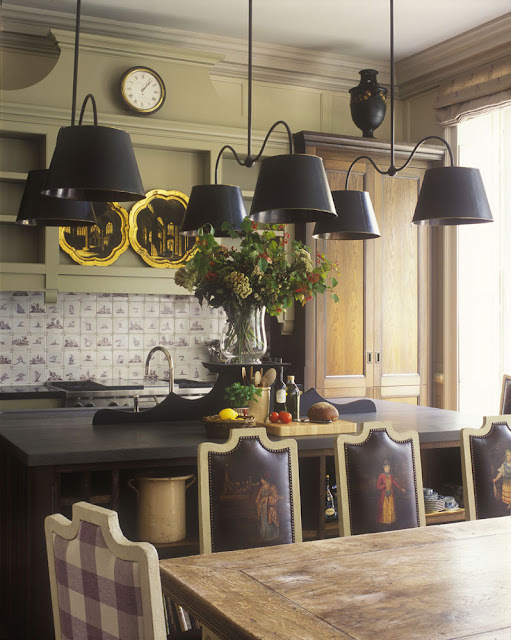 A harmonious interplay of French and Asian styles. Designer Christopher Noto. 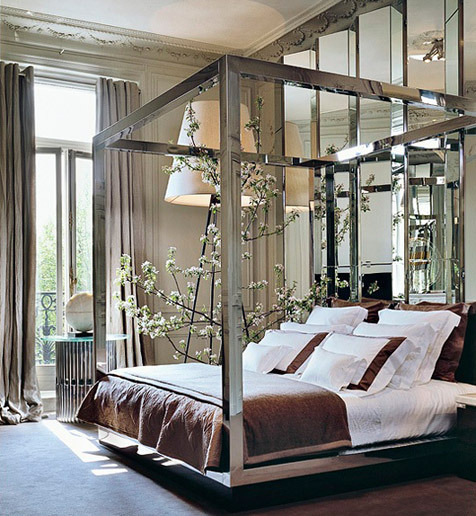 Elie Saab's private refuge in Paris. Designed by Architect Chakib Richani. French elegance with American comfort as designed by Timothy Corrigan for California clients in their Paris pied-a-terre. 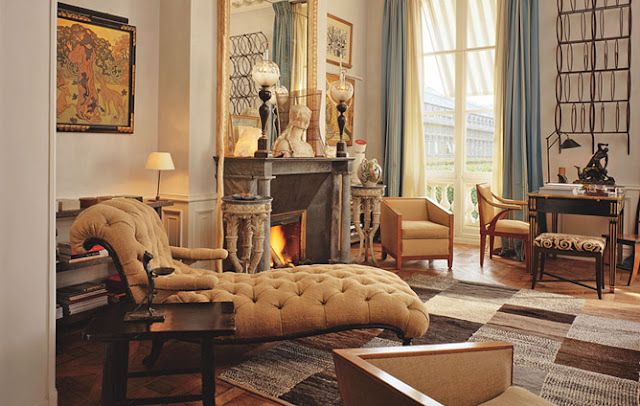 Situated on the top floor of a 1910 building in the seventh arrondissement with a view of Notre Dame. 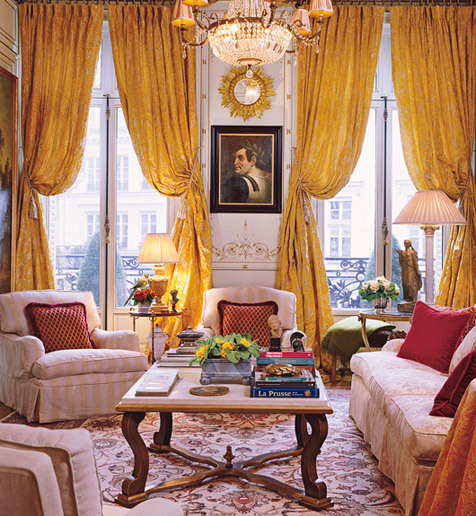 The apartment of interior designer Jean-Paul Beajard. 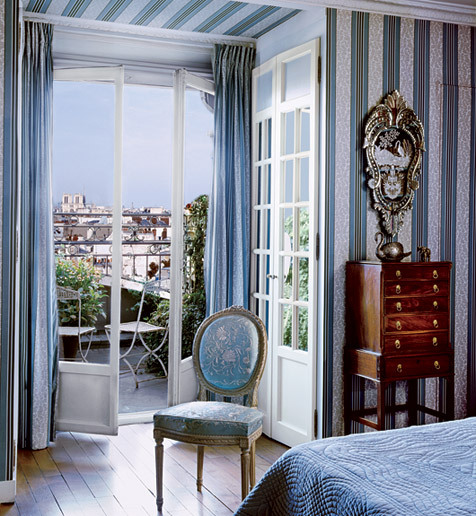 Designer Juan Pable Molyneaux bought and renovated the lower two stories of Paris's 1618 Hotel Claude Passart as a personal residence. I have a favorite, do you? Want to see more of this Paris feature? Click here. The newest member of our family wasn't too sure about her older cousin, our son Austin. 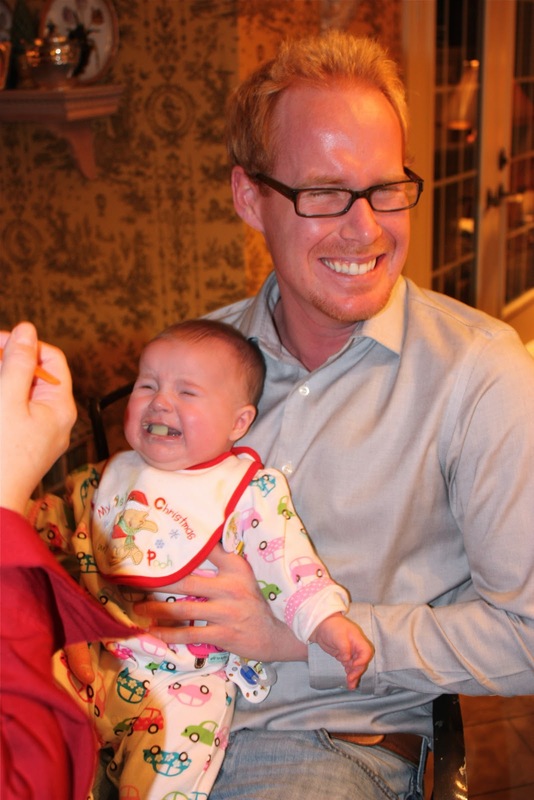 We all figured what little Chloe was really saying was " I want turkey too, not this pablum stuff"
Finally fed, changed, rested, and ready to party the night away on her 1st christmas. Much happier being held by Mom. I tell this story all the time, or at least whenever the subject of great interior designers comes up. My design partner and I met Vicente Wolf at a High Point, NC showroom years ago and it was the inspirational highlight of our trip. It was the end of a long market day and I am sure everyone wanted us out the showroom doors but Vicente Wolf spent a good twenty minutes leisurely chatting to us about the world of design. We pretended to be savvy and cool but all the long way home to Canada we kept saying" OMG, we met the Vicente Wolf, how can someone so talented and famous be so humble and nice too?" Then we worried that we had sounded like a pair of country bumpkins, and I am quite sure we did. When Vicente Wolf joined the blogging world, it really didn't surprise me. Nor does it surprise me that he shares his vast knowledge and experience with blog readers, many of them young designers starting out ................he has a sincere passion for interior design and is evident in every room he creates, every book he writes, every conversation he has, even the short ones. 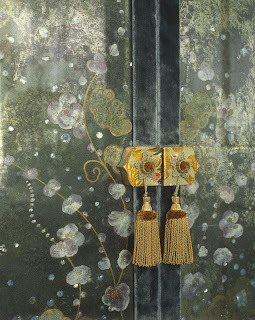 His newest release Lifting The Curtain On Design is certain to inspire me once again. And I love how he cleverly wraps his book gift with the title showing. Twenty years later, he was kind enough again to respond to my gift wrapping request for Gift Wrapping Holidays 2010 as he was rushing out the door for an extended trip. Somehow I assumed his gift wrapping would be executed in the layered, neutral palette that he does so perfectly.............surprise, surprise. 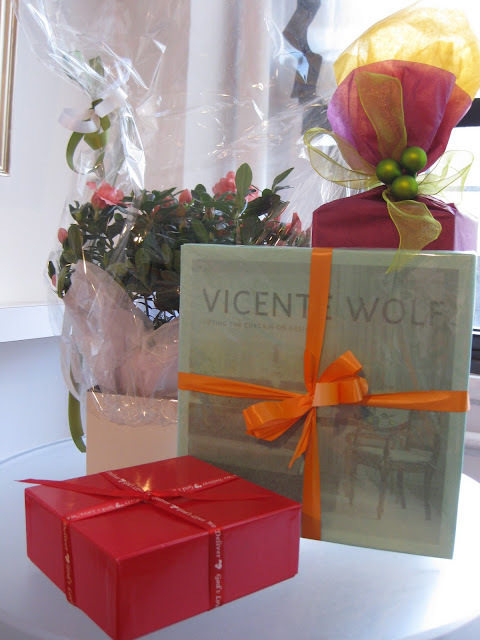 When it comes to gift wrapping, Vicente Wolf goes for full colour. And lots of it. Your interiors are designed with a restrained aesthetic but always with an element of surprise Vicente. Do you gift wrap with the same refined style? Or do you incorporate an element of surprise? When choosing my wrapping I prefer an unusual blending of colors. I also like to wrap up several items so there is a sense of discovery, but usually my gifts have a theme. 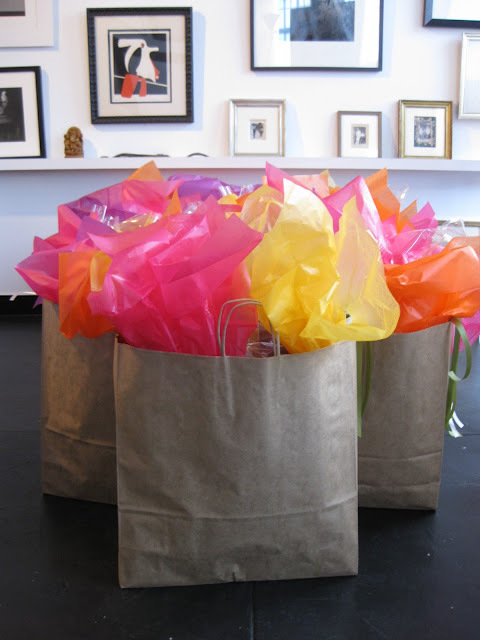 As an interior designer, so you think gift presentation is an extension of a designer's personal style? I think anyone's gifts speak of who they are - how much energy they put into it and what their sensibility is. Your interiors are influenced by your global clientele and travels. do you use any of these influences in your gifting or gift wrapping? Yes, I do. Two years ago I was in the Sunday market in Bangkok and I bought gifts to put in my next gift basket. It was a lot of work but people loved the fact that it had such a strong Thai flavor literally and visually. Your client Clive Davis invites you for dinner. Your favorite hostess gift? He is a hard person to find a gift for, but I would say a book or one of the artists he collects, although he is someone who prefers to give than receive. This makes him even more special. 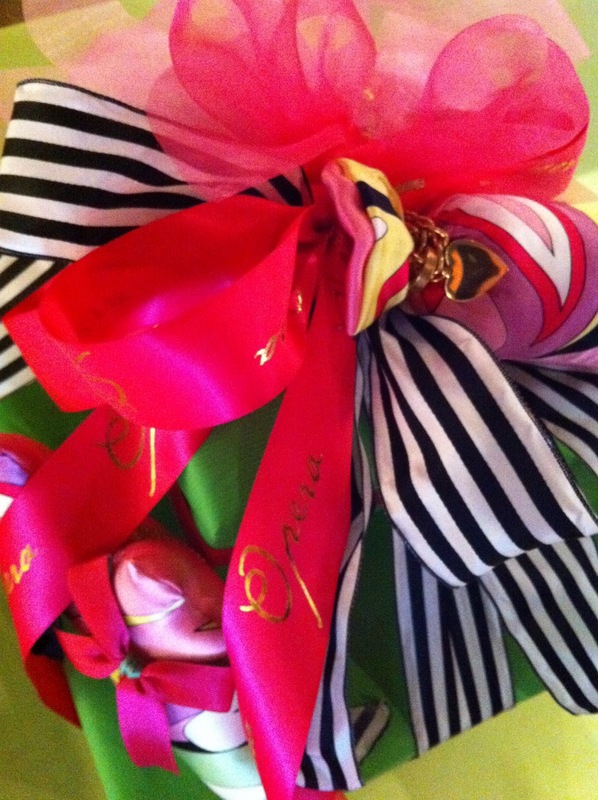 Do you have a gift wrap signature? 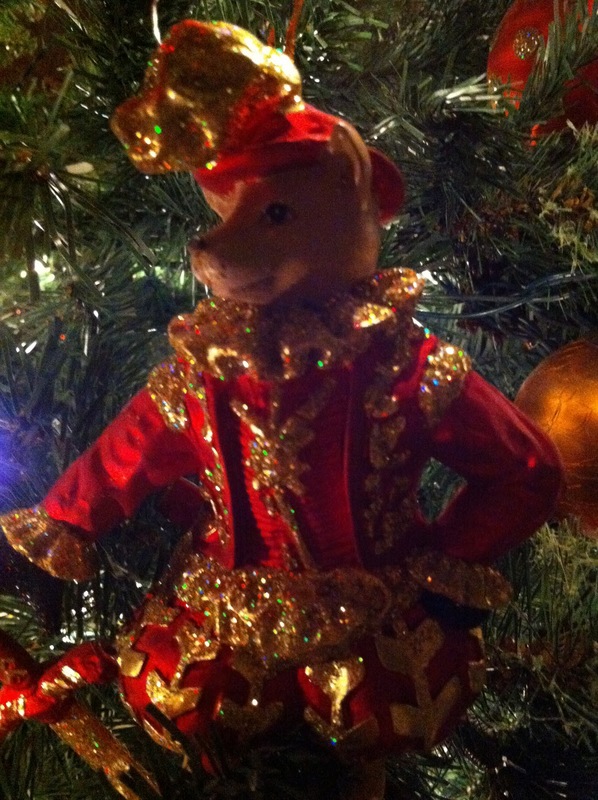 Something that says this is a Vicente Wolf gift? Yes it does, my gifts are like a string of wild pearls, all individual and unique objects strung together in a big gift package. Not only do I greatly admire the exquisitely-detailed design work of Britain's talented design star Nicky Haslam.................but he is also an incredibly good sport to say nothing about providing the most gorgeous gift wrapping backdrop. No wonder he gets invited to all the best parties (and is know to give smashing parties too), in my book he is a wonderfully gracious man. When his fabulous team suggested a gift wrapping video to go along with my Q & A interview for the Gift Wrapping Holiday 2010 series, I was honoured, thrilled, and intrigued to say the least. I would suggest you read the interview below before viewing both videos to see why Nicky wraps the way he does, a few tricks, a simple but exquisite signature touch, and Voilá..............his new book Redeeming Features stylishly wrapped up in Nicky Haslam style. Nicky provides a surprise gift wrapped finale and wraps it up with a disarming smile. A personal request for my readers, please head over to his NH-Design blog and tell him what jolly good fun his gift wrapped video was to view, showing you how to do two things that will help you this season. How to do a quick ribbon measure and an proper technique for easily tying a simple bow. Multiple links for Nicky Haslam are listed at the bottom of this post so you can read more about the designer life of Nicky Haslam who really does do his own gift wrapping. Nicky, you are the rock star of the interior design world, you party with the who's who around the globe, design for the rock stars, pal around with Mick Jagger, and hang out with Kate Moss, so the big question would be "what will you give Kate Moss for Christmas this year?" As well as a huge kiss, a jeweled frog as she admired one I have. The Evening Standard recently named you as one of London's most influential people because "he gets invited everywhere because he's the best company". Besides your good company, what do you consider a fabulous hostess gift? Well, you can't go wrong with "fois gras! Your creative lifestyle is evident in everything you do, design, and wear. 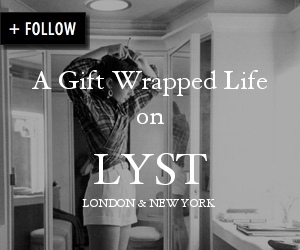 Does gifting and it's presentation demand the same attention to detail? Yes! Either wrap up well (or warm) or not at all! 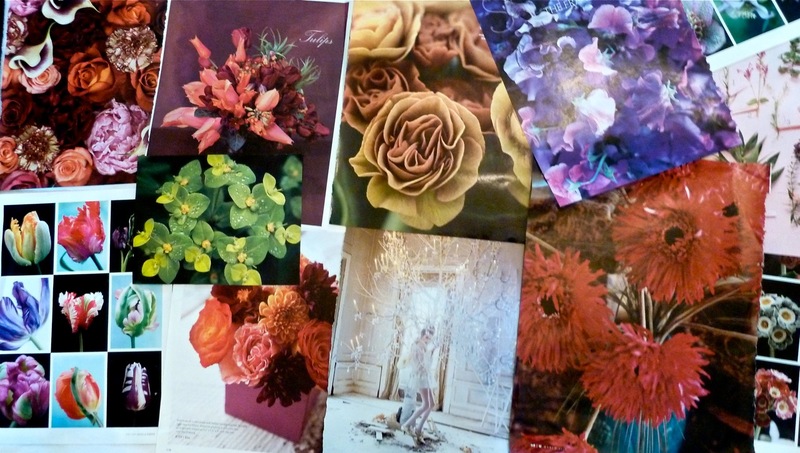 What would you consider to be the best gift wrap paper style? Are you big on ribbon and bows? Or do you have another way to add your own gift wrapped style? 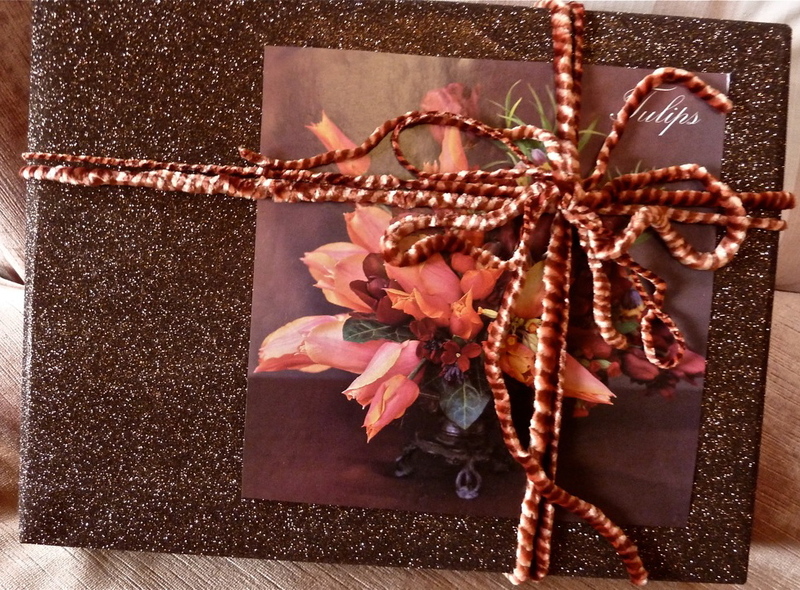 I like gold or white paper and a simple ribbon, and I always use tissue paper before wrapping. It is very luxurious to add tissue paper. You have to be the person to ask "What should someone give Prince William and Kate Middleton as a wedding gift?" Even a princess can never have too many hurricane lamps and candles! If Oprah called and had you on her show to plug your juicy new memoir Redeeming Features what would you send her as a thank you gift? I'd send her the recording of my recent cabaret act at The Savoy (to help launch their new bar ~ The Beaufort Bar). How would someone recognize a gift from Nicky Haslam? 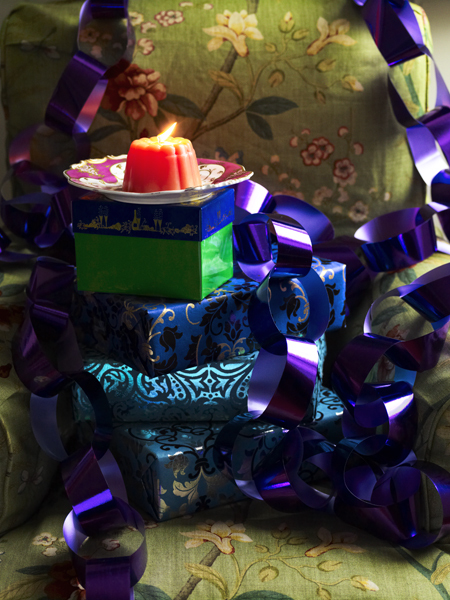 What is your gift wrapped signature? Their initials on a white card which I tuck into the bow. 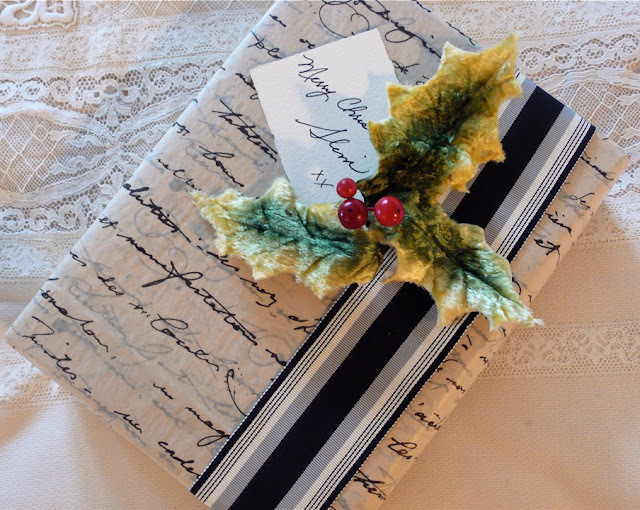 I am thrilled to start off my Gift Wrapping Holiday 2010 series with our most talented author and blogger Vicki Archer of French Essence. I always wondered how the most stylish people wrap their holiday gifts and as we know peeking into Vicki Archer's world is always a pleasure. Her new book French Essence has quickly become "the" book to give and receive this holiday season. 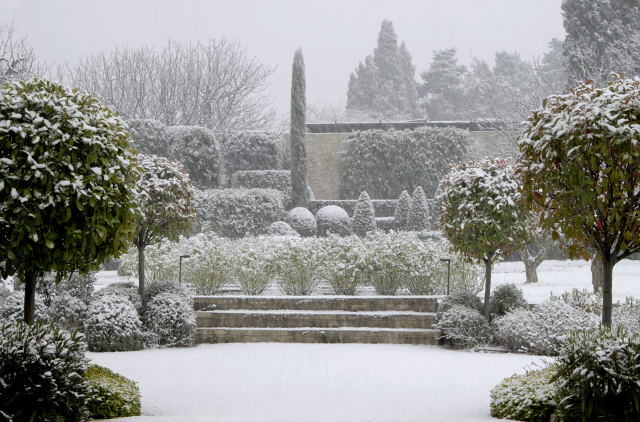 I know you are working with a fabulous new colour scheme this year of silver, white and green. Is it working it's way into your gift wrapping too? I like to co-ordinate my gift-wrapping with the colours that I choose to decorate our home. 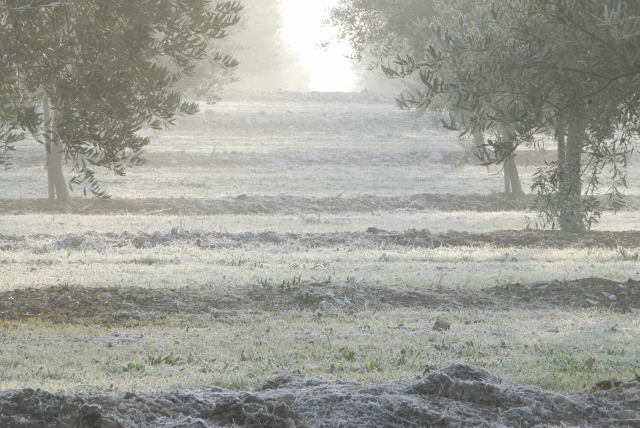 I am for the first time trying a silver, white and emerald green scheme….I normally love the brighter reds, violets and oranges…but this year I want to try and create the same silvery ambiance inside the farmhouse as I see outside in the olive groves on frosty mornings. Are your gifts under the tree wrapped to match the holiday decor or do you wrap to suit the personality of the recipient? I wrap to suit my home decor, sometimes I might add a little whimsy for an individual personality but generally I match the paper and the ribbons to the colour scheme I have chosen. This year I am tying a decoration on each of my gifts, so this will be the way I personalize them but stay within my colour scheme. 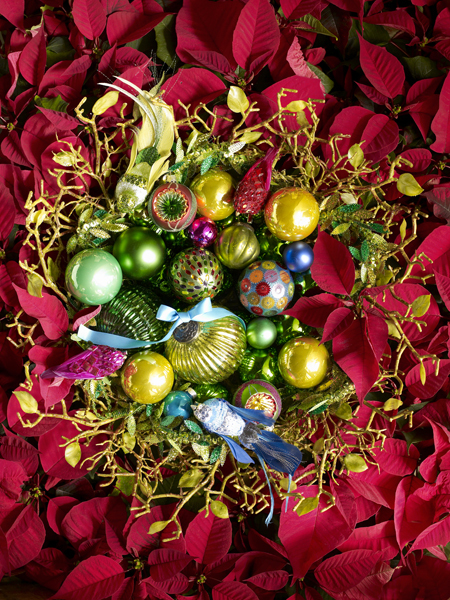 You devote a whole gorgeous chapter to Christmas in your new book French Essence. 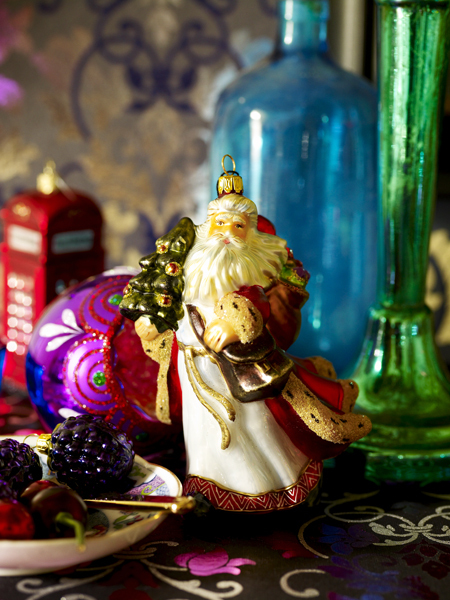 What is different about your personal festivities in France? What has changed from the traditions you grew up with in Australia? A French Christmas is a winter Christmas and that is the biggest change for me as an Australian. 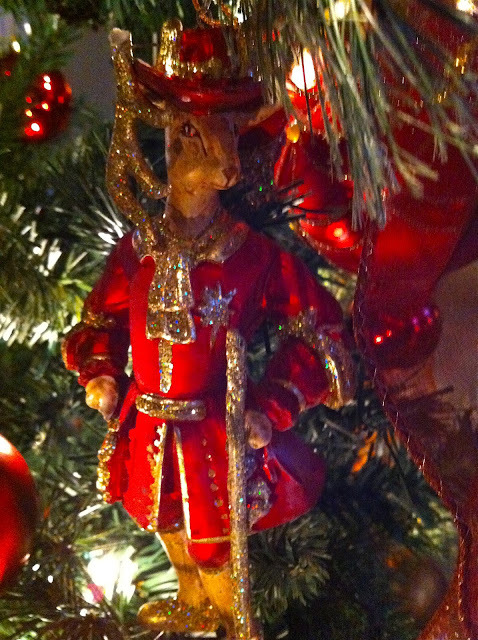 I love that Christmas in Europe now mirrors the Christmas of my childhood imagination. In Australia growing up we celebrated the holidays in a traditional way with all the trimmings, despite the heat, so as a family we have continued on in that way. Now I incorporate many of the French traditions into our celebrations….mostly these changes revolve around food…as they tend to in France…We now have added fois gras and oysters to our menu along with many of the sweet deserts that the French favour at Christmas time. The other novelty for me is mistletoe…I love to hang this over the door…The Australian in me finds this custom adorable. 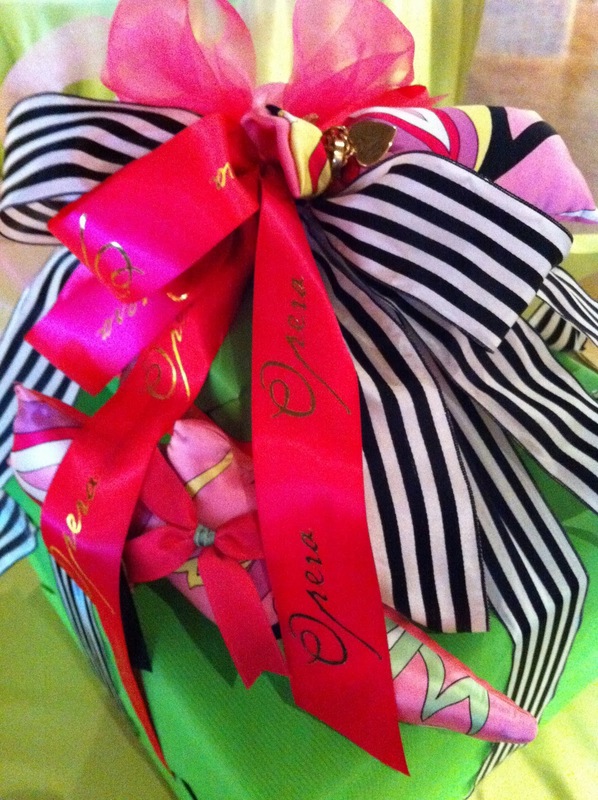 Your favorite ribbon? Satin, silk, taffeta, or grosgrain? Narrow or wide widths? 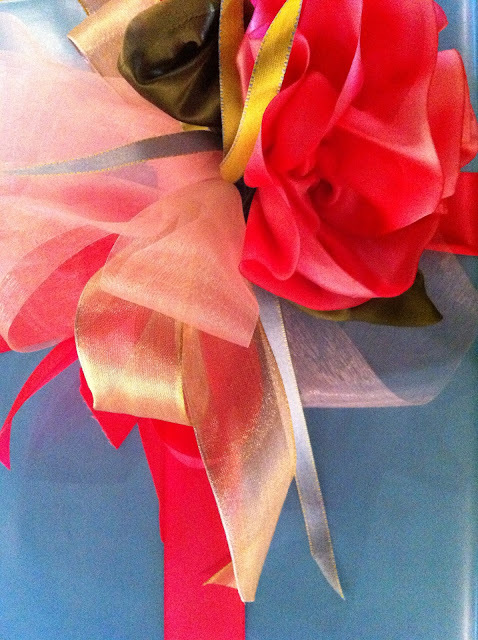 I love taffeta and grosgrain ribbons as they make up so beautifully. 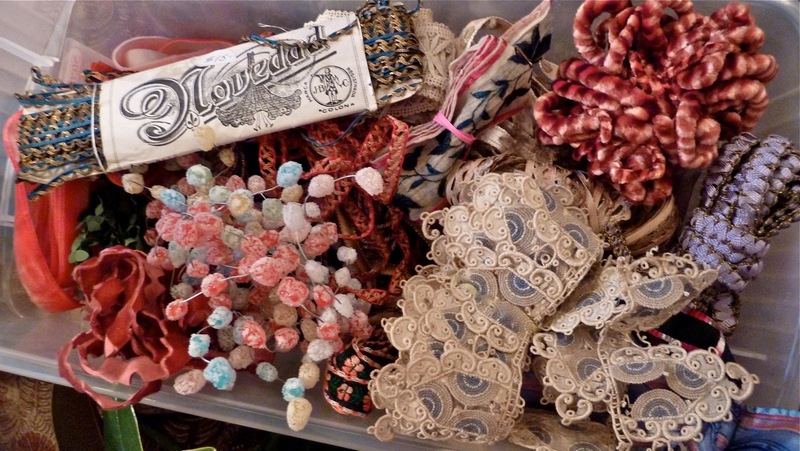 But then I love silks and satins too….I just love ribbons and especially vintage ones….Both narrow and wide can work…it depends on the size of the package…but wider is generally my preference. I like simple, but striking wrapping so tissue is my first choice. I often use old movie posters or newspaper too…Sometimes the most simple ideas can look the most effective. Do you have a favorite embellishment this year? 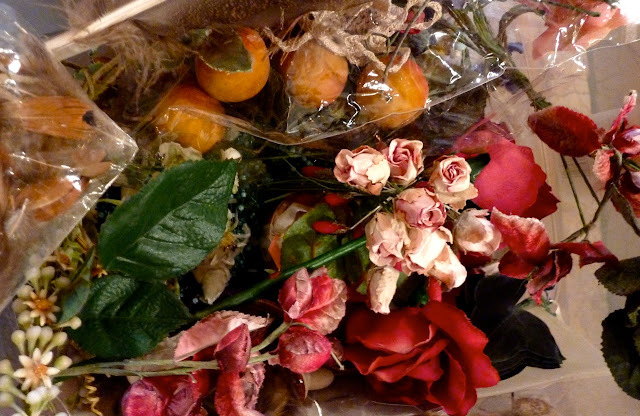 I have found some pretty decorative ‘birds’ and some silver flowers that I will add with the ribbons. I am also thinking that I might weave through some olive leaves at the last moment. What is your perfect hostess gift this season? In France I will be giving boxes of Charbonnel & Walker Rose and Violet creams or old-fashioned sweets from Fortnum & Mason. In London I will be taking a mixed selection of chocolates from Joel Durand from, our local chocolatier in St Remy. These gifts make for lots of carrying back and forth but I try and give something that my hostess could not otherwise have. What do you think gift wrapping presentation says about a person? Gift wrapping shows that you have taken time….and giving of your time is the most generous and thoughtful present of all. Taking time and making time is a true mark of friendship. 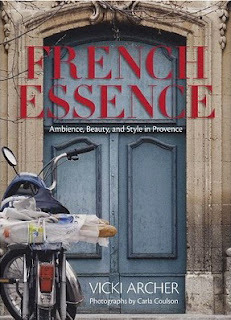 Do you have a signature wrap for your fabulous new book French Essence. I am waiting for you to come up with that Sande! 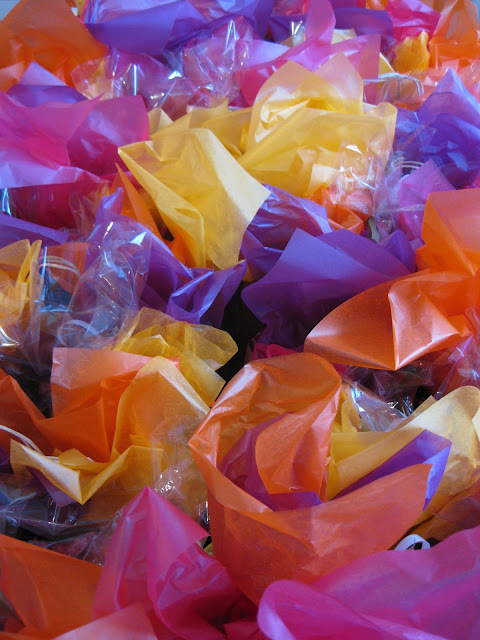 What is the best part of gift wrapping beautifully? The expression at the receiving end when you give the gift makes all the creative thought and energy worthwhile. I am still thrilled every time I receive something beautifully wrapped. 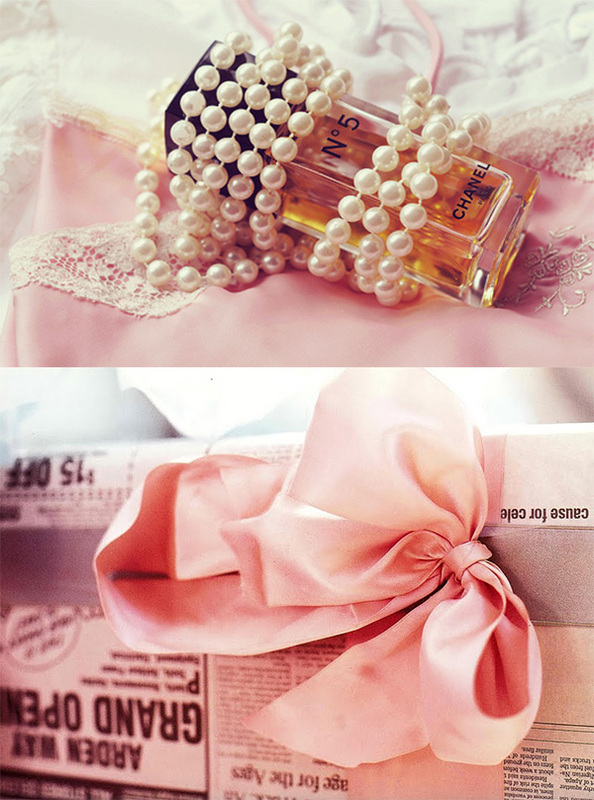 It heightens the surprise of what is inside and to be given an exquisitely wrapped present is a real treat. 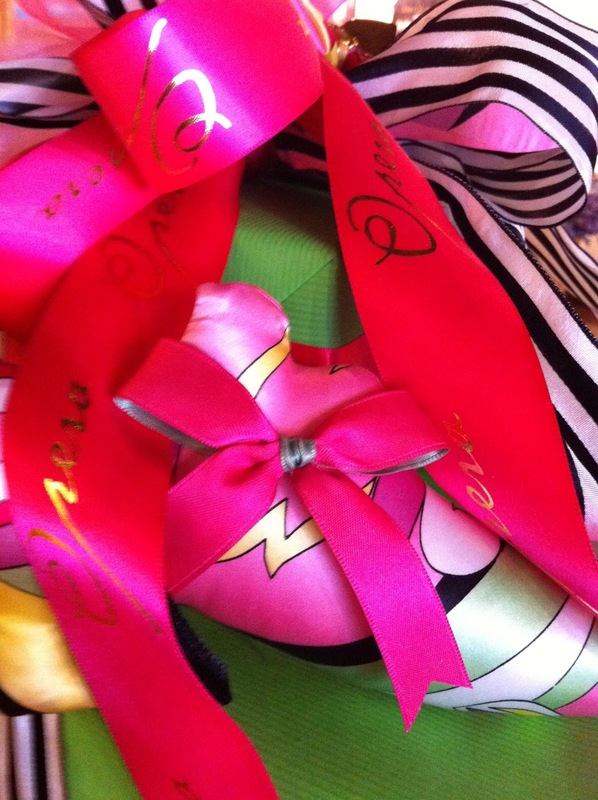 We all need to be spoilt from time to time and that is what beautiful gift-wrapping does….it spoils us. Pink Paxil.........and a surprise gift wrapped series you will love. If you don't read the blog Slim Paley, well....................you are just plain missing out. 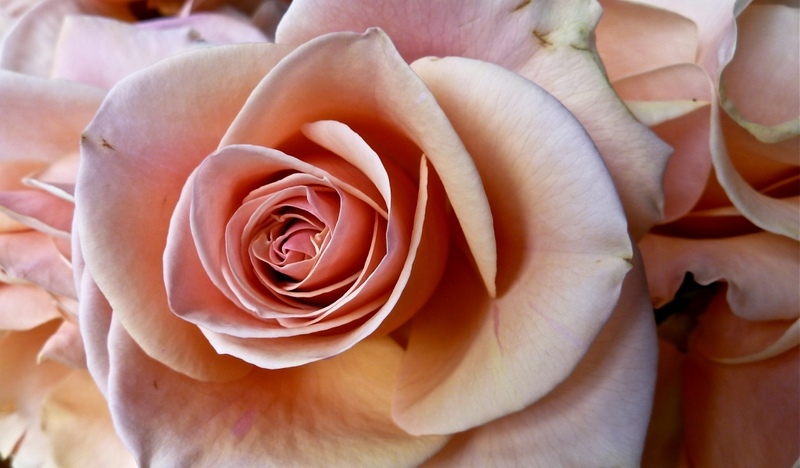 She took this shot of her late-blooming roses from where she lives in Santa Barbara. And in great style too I might add. You know that ultra stylish and cool friend, the one who always knows everything cool? That's Slim Paley, with a wicked sense of humour too which makes it all the more fun. I still think she is pulling my leg on these roses though.......................Slim? Some blissful pink images from Absolutely Ladylike, a most ladylike and dreamy pink blog by the talented Evi. Keep scrolling and see the gorgeous white dresses by Hungarian designer Marta Makany. 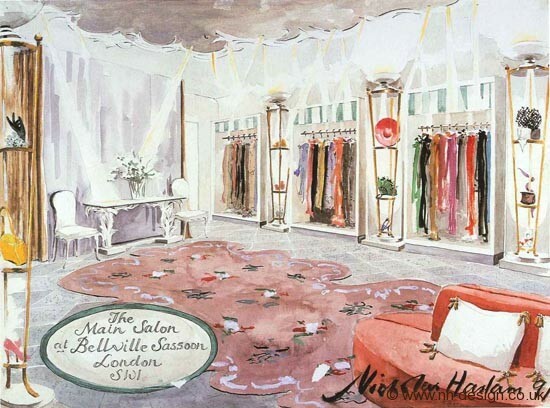 How gorgeous is this interior rendering by British designer Nicky Haslam? Have you been reading his entertaining blog? Well I certainly have and I have the most wonderful surprise for you this week. I interviewed Nicky via email with some gift wrapping questions and not only did he graciously answer my questions, he and his staff did a fun gift wrapping video to show us how he wraps for all those rock star friends of his! 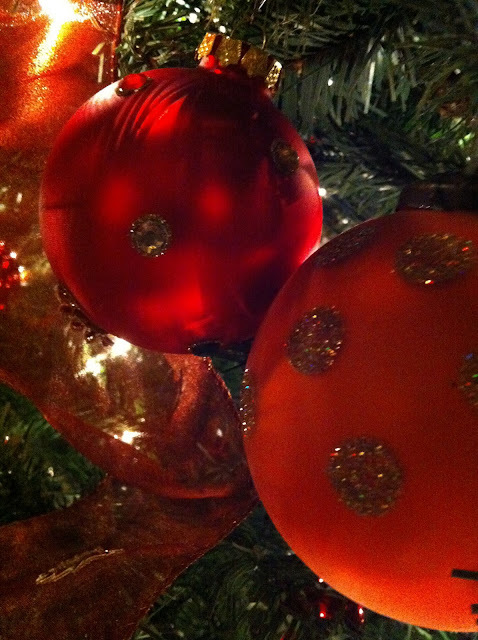 Stay tuned this week..............my first blog video and I promise you some stylish holiday entertainment. I have a surprise list of stylish people gift wrapping for A Gift Wrapped Life over the weeks ahead and............ is this fun or what? If you read yesterday's post you would know that we were wrapping up a large book gift order in two styles to see which we liked best. The wrapping elves over here think they prefer prototype number two in Turquoise and Red. It might be the hand-dyed silk flower that gives it it's competitive edge and the mix of colours which just happens to match the book cover. Each gift will alter slightly as I am working with 6 colours of silken ribbon roses so the production line and ribbon variation will get more interesting. So might the conversation, we'll definately be opening a Chardonnay to go along with the after-hours task at hand. I am certain that even real elves put something in their eggnog each year. I am not the only one wrapping all day long at the POP UP shop. Since there is now three of us wrapping elves I think I can swing showing you a package a day.............just to keep you inspired for the holiday gift wrapping days ahead. This is a wrapped prototype for a gift order of over 50 book gifts. I will show you the wrapped competitor tomorrow. Sometimes I can't decide which I like better................so feel free to weigh in with your opinion. This one has a pleated detail which I like but is a tad more difficult to keep perfectly lined up with gift wrap paper, easier with tissue paper for some unknown reason. Or perhaps I just need more practise. When you see scented sachets on sale, grab them. Not only do they make for stylish embellishments when it comes to gift wrapping those special gifts, your gift will smell really, really good. In this case, someone stylish who is turning 50 and just happens to love shoes so this Pucci pattern and whimsical shoe shape fits the gifting occasion. I told the customer I would wrap it one way then went totally off into another direction, good thing she gave me some creative leeway. It's always best to give me some, I do a better job. Adding a matching sachet of another shape to the top of this 2-tiered gift just adds to the glamour and fun. 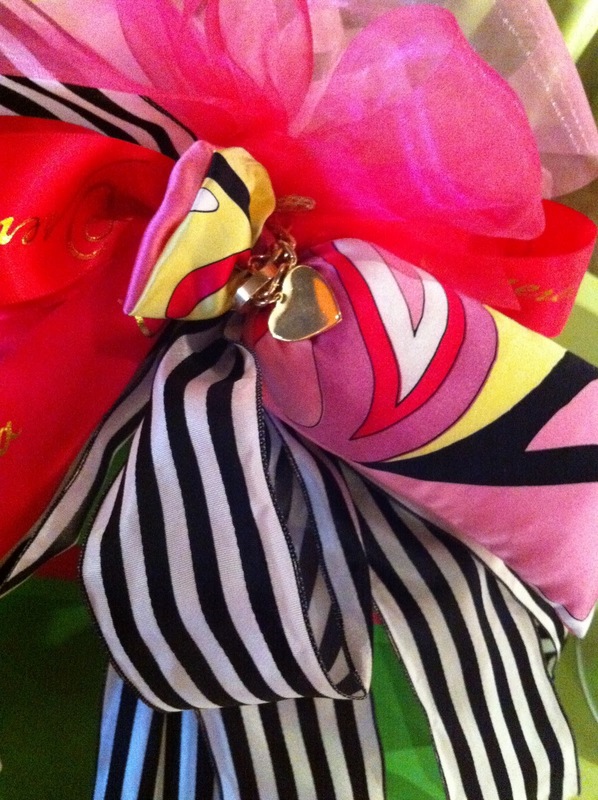 I liked the black & white striped taffeta ribbon with the Pucci print. It was making me feel kind of groovy while wrapping this celebratory gift. I am guessing the birthday girl will be feeling a groovy kind of love as well. When it comes to celebrating a 50th Birthday, the more ribbon the better don't you think? Trust me on this, when wrapping a 40th or 50th birthday gift go as special as you can in technique and effort. It just makes the milestone event that much more fun. Two hot pink gift boxes were wrapped in Kelly Green paper. I took this photo quickly with my iphone (should Apple send me an endorsement contract or what?) so the colours aren't exact (my fault) but my hot pink Opera ribbon just adds a bit more glitz. Get ready ladies, lots of gift wrapping ahead. I will tell you all about what's ahead in the upcoming week. We have a perfectly good tree, actually quite a beautiful one. Trouble is no one wants to put it up anymore. It's not that we are disinterested, lazy, or grouch, but it's too big, too heavy, too many days to fill, too many lights every year that don't work. I am a believer in adjusting to life as it changes and so off I went and bought one of those mass-produced pre-lit fake trees to get us through a time-crunched year and you know what................it works, it works just fine. Just don't look too close at the branches. For various reasons, we haven't put "the" tree up in two years so I forgot all about these handsome ornaments, my very favorite. 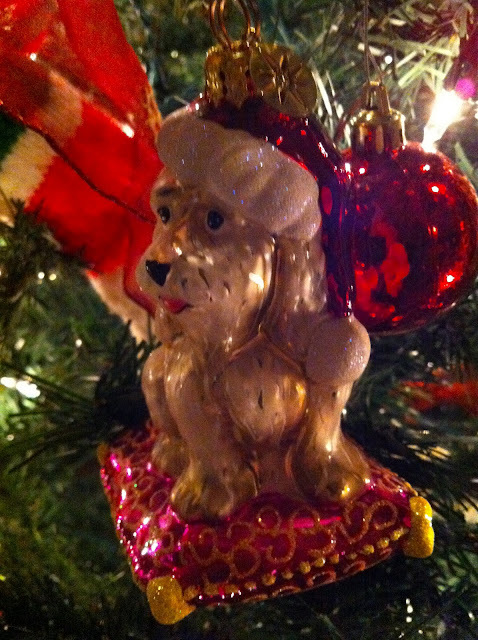 Isn't that the fun part of decorating a tree, finding all the stuff you forgot about? I wish I could get more of these, especially since I dropped and shattered two of them today. 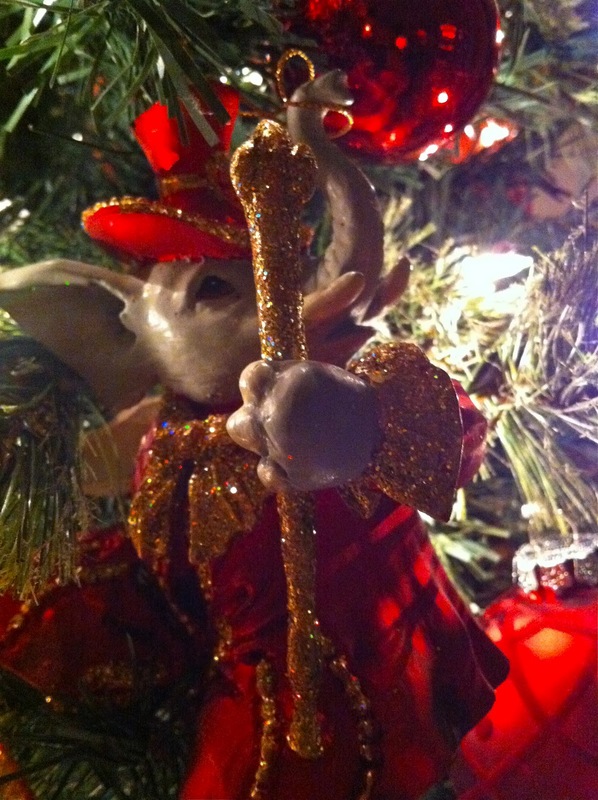 This tree is much smaller so we didn't pull out all our ornaments, I am hoping there is another box of these dandy elephants and deer. I just adore their sparkly attire. We obviously love dog ornaments. Forgot about these too. 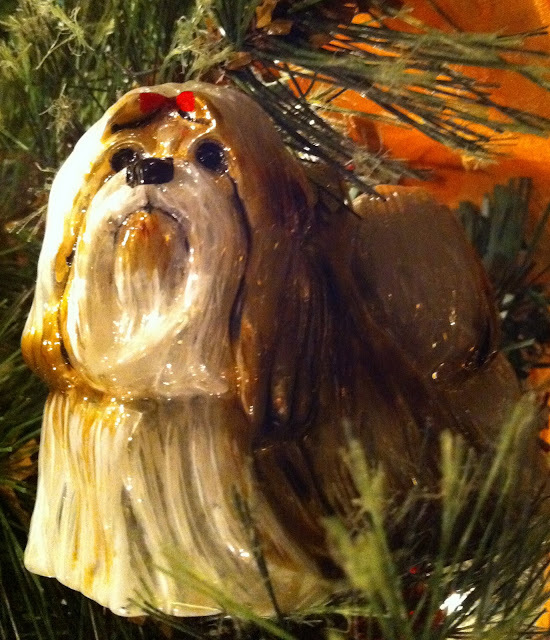 Our Shin Tzu ornament. we all went "ahhhhh............" when this one came out. I promise to put away my addictive iphone in the New Year for better photo clarity but right now it is working quick and easy. Is this a dog too? Or a wolf? A fox? Obviously, I should watch less HBO and more Animal Planet. I thought I might change it up this year but you know what? 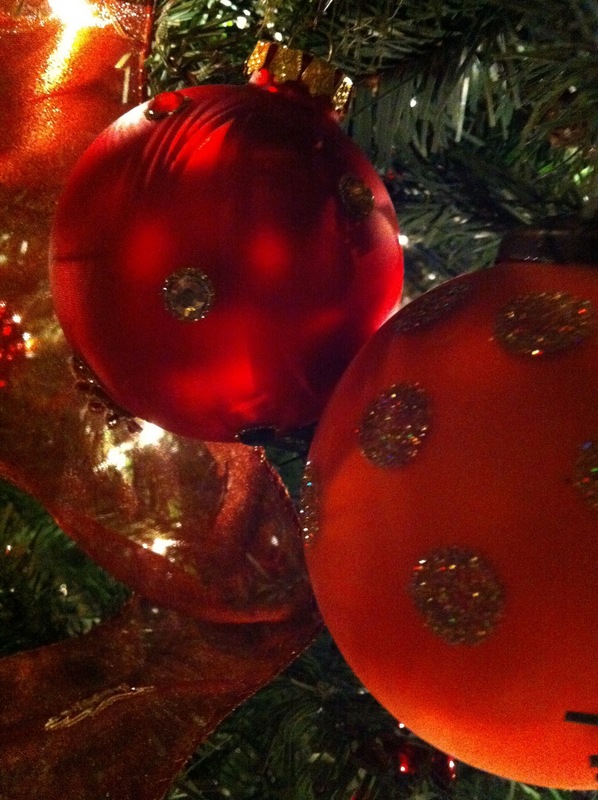 I still really like this red and orange tree. It will do just fine. Do you know I actually keep a photo file labeled "DJ's fashion" as in the blog Dust Jacket Attic, we already know no one does styling better. She showed this floral-laden creation yesterday and I really can't get this pleated splendor out of my head. 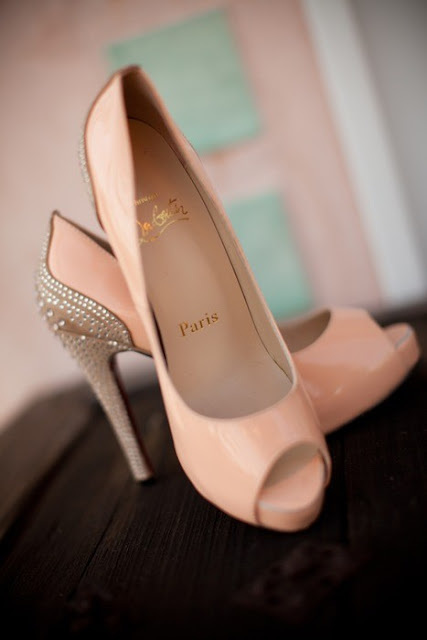 Nor picturing the shoes that would go with it. Have you ever seen anything so exquisite? This is my Princess Dress or my Mother Of The Groom dress for when that day comes along. Quite simply..............I want this dress. And the chocolate taffeta skirt with the gorgeous overlay seen in the same post, don't look too long at either of them, this fantasy is all mine. Happy weekend and a peachy welcome to new followers.